Each morning there always seems to be the question of how many decoys to set. On public land this gets even more challenging as you throw into the equation fellow hunters in the flight line of birds. Below is my thought process I go through each morning on public land after choosing a spot. Is there a ton of other hunters around? If yes, I will probably run a large spread for two reasons. The first is the visibility it provides. The large spread instills confidence to the birds that all is safe. The second is that the likelihood of changing locations to find a better spot when the marsh is crowded rarely pays off. I have found it is better off to stick out an OK spot on crowded days vs. looking for a new spot. There is probably a reason the new spot you find is empty. Scratch that thought if you see birds pouring into one spot. Get over there and get a limit ASAP! If there is not a ton of hunters around, I will probably set a smaller spread. The small spread allows me the flexibility to pick up my decoys quick and make the location or set adjustment quickly if the spot I chose in the dark is not where the ducks want to be that day. 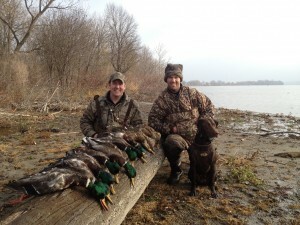 Portability is key when hunting public land ducks. Is it snowing? If yes I almost always run a small spread. The less decoys I have to keep snow free the more time I can spend hunting instead of cleaning decoys. You don’t always get your choice of spots on public land. Did you end up in a small pocket or a large open water point? If you are after puddle ducks, on a small pocket set I would put out a small spread. It is just easier and the birds will be working close anyways. If you are on open water, I would put out a larger spread and run lots of goose decoys if you have them. The increased visibility of goose floaters can be a real killer some days. Are you hunting a zero wind day? If yes, I would downsize the spread and run a jerk chord. And last but not least….hide like a ninja. Public land birds can pick out hunters quickly if you are not well hidden. By using the tips above I know you will kill more public land ducks!